Haven Gallery has meticulously curated a world of wonders that draws intrigues and pushes boundaries on the conventions of art. The Northport Village gallery features artists from around the world whose work embodies a whimsical, narrative nature. The newest exhibits opening this week are “Enchantress” by Eeva Nikunen, “Sanctuary” by Raúl Guerra, “Enchanted Wanderings” by Jessica Mulholland, “Inner Wilderness” by Nikole Cooney and Music Box IV. An opening reception will be held Saturday, Jan. 26, 6-8 p.m. and the exhibit will be on display until Feb. 17. Owner and curator Erica Berkowitz cannot classify the artists into one particular genre or style, but finds it crucial that the work stirs her. Her goal is to display work that “provokes people in a positive way,” causing them to think and feel while forming their own interpretations. She finds art is a tool for communication and prefers to have it speak for itself. 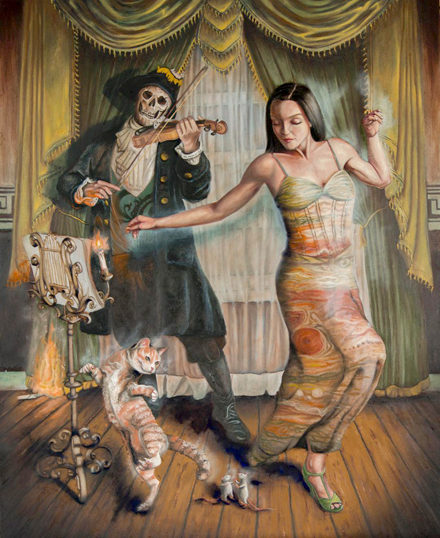 After earning a bachelor’s degree in art history from Stony Brook University and a master’s degree in contemporary art from Sotheby’s Institute of Art, Berkowitz worked as director of Last Rites Gallery in Manhattan for nearly three years. She desired more freedom in her decisions. A little fearful, Berkowitz’s husband (and artist) Joseph Weinreb pushed her to take the plunge. Berkowitz, who grew up in Plainview, said there wasn’t enough diversity in art and wanted to bring her vision to Long Island. She now lives in Northport. Northport artist Joseph Weinreb artistic adaption of “Don’t Fear the Reaper” by Blue Oyster Cult is featured in the exhibit, Music Box IV. “We wanted to support where we live and bring something new to the area, but also bring more culture and education… This is something completely different, something Long Island has never seen before,” Berkowitz said. Haven Gallery exhibits change monthly, providing a constant flow of fresh work. One element many of the artists share is precision with a refined touch. Take a glance at the art on the walls and you may think it was digitally rendered, but step closer and find many are paintings or drawings. Berkowitz selects every artist that will show, drawing from artists she’s worked with previously and those she has followed online for years. It is essential to Berkowitz that she loves an artist’s work before it is on display. For solo exhibitions, Berkowitz leaves everything up to the artist, from the theme to the pieces they choose. This month’s artists feature styles from around the world, Nikunen is from Finland, Guerra from Spain, Mulholland from England, and Cooney from Florida. “I don’t care where they’re from. I don’t care if they’re just out of college. If they’re really that talented and communicating something I feel is important and we can share, then we will do that,” Berkowitz said. Artist Julie Filipenko from Tel Aviv brings Nina Simone’s “I Put a Spell on You” to life for Haven’s Music Box IV exhibition. Haven Gallery’s annual group show, Music Box IV hosts a variety of artists, who were inspired by a song or lyric and channeled this energy into a piece. “Hopefully this connects people in a different way, because they’re looking at something visually but then also hearing a song in your head simultaneously, that can invoke the auditory and visual senses,” Berkowitz said. Take a trip to the gallery and you may find yourself walking out with your own piece of art. Many have become “first-time collectors” at Haven Gallery. Haven Gallery is open Wednesday through Sunday, 12:30-6 p.m..